Reading Rainbow has been off the air for eight years, but it has only taken about half a day for LeVar Burton to raise over $1 million to bring it back. 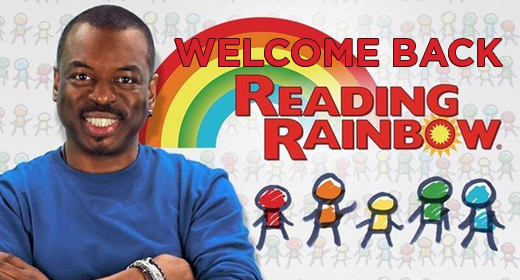 Reading Rainbow, a television series that introduced new books to young viewers and encouraged them to read, was an Emmy-winning PBS staple from 1983 to 2006. Burton has now developed an updated version of his popular show that will air on the internet, and will include home and classroom options as well as provide virtual field trips for students and teachers. The only thing holding him back? Funding. So Burton established a Kickstarter campaign on Wednesday to help raise the money needed to bring Reading Rainbow to a new generation of viewers. Within a few hours, over 23,000 donors had helped Burton hit his $1 million goal. Wil Wheaton, Burton’s co-star in Star Trek: The Next Generation, was one of several celebrities pledging funds and spreading the word. With ebooks growing in popularity and most children having access to computers, tablets, and other electronic devices at both home and school, Burton’s passion project is perfectly timed, and it will be exciting to watch him take something so significant from our childhoods into the future. Jamey Nunley liked this on Facebook. Oddball Gaming liked this on Facebook. @JustUsGeeks He’s also charging for it on a monthly basis upon launch. :/ The original Reading Rainbow was free on PBS.